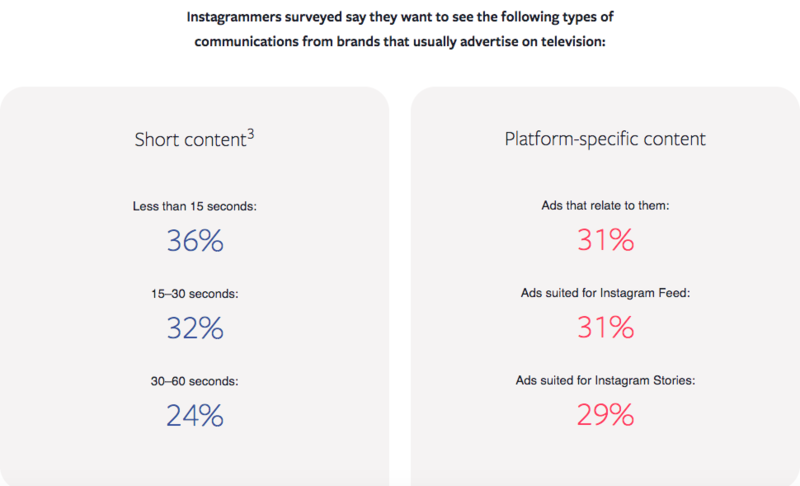 Marketers love Instagram. It's a visual communication masterpiece. You can quickly post a beautiful ad and not appear "salesy." Consumers love Instagram even more. It's highly engaging, and everything about it is fun. I’ll be the first to admit it; I click on a lot of ads on Instagram. More than I do on any other social media site. Let's face it, if you have a personal account, you do too. I will bet you a cup of coffee that you've clicked on at least one ad on purpose. Right now you've got your marketing hat on. You’re pumped. You’re ready to get your video content on Insta and start building your followers. Before you do, it's time for a history lesson on the “Gram” so you can understand why it works so well for marketers. Instagram is currently the 6th largest social media platform in the world, and it's one of the youngest companies on that list. First launching in 2010, Instagram began as an image editing/sharing app. Over the past 9 years, it has grown into one of the most sought after social media channels for visual and creative communication between consumers and brands. The platform is a visual landscape for users around the world. It allows users to capture and share what they see around them. Brands who offer a visual brand experience are receiving the highest amount of user engagement and follower cultivation. It's also one of the few social media platforms that favor relevant content. After significant changes to the platform in 2016, users were able to see more content from the people and brands they followed rather than pushed/suggested content. Even though the quantity of branded content was reduced by the most recent Instagram algorithm change, the quality of branded content went up for all of its users. Instagram's primary focus for its users is relevancy, and that includes branded content. It's easy to forget that Instagram is owned by Facebook. Instagram compares much differently to its parent company and actually outperforms them in several areas. Pictures and videos are the only forms of content shared, which is enough to set it apart from the most other social media platforms. In 2010, users could only share pictures. It was the first social media platform where users were only able to share one form of content. It was refreshing. In 2013, Instagram made video content available on its platform. In 2016, Instagram's story was launched to compete with Snapchat directly. In 2018, Instagram released IGTV for a way for brands and users to broadcast long-form video content. All of Instagram's features are focused on sharing creative, visual, and personalized content. That's the type of material that resonates as authentic. 90% of consumers say authenticity is essential when deciding which brands to support. Brands get discovered on Instagram. 71% of U.S. businesses use Instagram today, and this is projected to keep growing. Companies are flocking to the platform due to the exposure and following they are able to capture with its users. This can be traced back to 2016 when Instagram switched up the way they curate content for its users. The new algorithm favored relevant content over branded content. Users were suddenly able to see 90% of posts from friends and family, compared to 50% before the upgrade. Even though this switch meant consumers would see less brand communication, brands saw an upward spike in user engagement. Instagram's update empowered its users by showing them more of what makes them happy. Freeing up consumers from being bombarded by ads on their feed makes them more receptive to viewing the handful of ads that do appear on their feed. Instagram hit 1 billion monthly active users in June 2018. This number is staggering considering that they had 500M monthly active users in June 2016; meaning it took them only 2 years to double their user base. This puts the platform's growth rate light years beyond sloth-like growth rates of Facebook and Snapchat. The growth rate isn't the only impressive thing about Instagram's community of users. 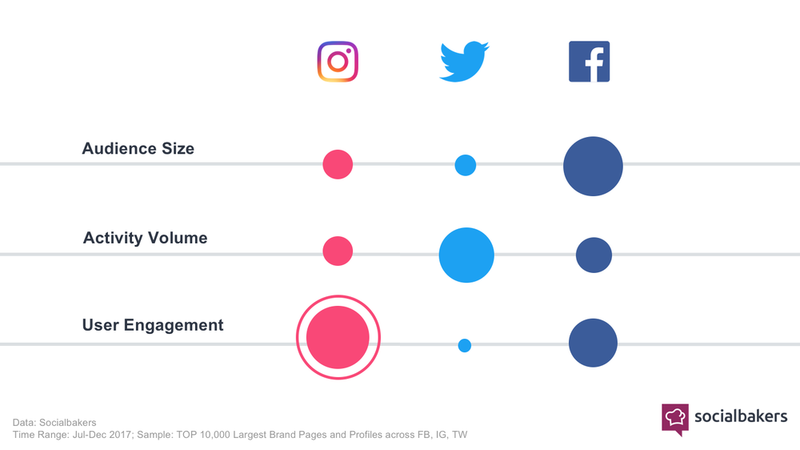 Instagram's user engagement is much higher compared to Twitter and Facebook. Take a look at the comparison chart developed by Socialbakers. Instagram's user engagement didn't always look this stunning. After the platform's update in 2016, brands saw a 105% lift in interactions. Check out how Instagram's engagement has grown since the 2016 update. Alongside the increasing user engagement is the amount of video content on Instagram. Video content on Instagram has seen an 80% increase year over year. Since the launch of videos on Instagram in 2013, video content has become the content of choice for users. Okay, now for the fun part. How the hell do you get connected with your audience? Even though you are allowed to post videos up to 60 seconds long doesn’t necessarily mean you should. Consumers prefer shorter video content, around 15 seconds. Your video content should be short, sweet, and to the point so your potential customers quickly understand the value of your brand. Get acquainted with the different types of audiences you can reach on Instagram. The ads can be crafted in the Facebook Ads tool, so if you have experience in that tool you’re in luck! Just load up your video and take a deep dive into the different ways you can target your potential customers. Your videos should be crisp, clean, and comfortable to view from a mobile screen. You only have a short amount of time, so make it intriguing for your viewers. The landing page linked to your call to action button should also follow the same criteria. Make the entire ad a seamless and smooth experience. Instagram has specific dimensions that should be applied to your video before it gets published to enhance the overall appearance. We’ll cover more of that in the next section. The platform has several areas to put content. Develop a mix of what you post to your feed and stories. Maybe even figure out how to incorporate the longer-form IGTV in there. Your story, for example, is a great place to put behind the scenes content. It lets your customers get to know the real people behind the brand, which is perceived as very authentic content. Instagram keeps it simple with the video length requirements. 60 seconds or less. Keep in mind that 15-second ads are what a lot of customers want to see, so try keeping your videos short and exciting. Vertical videos are a bit of a controversial topic in the marketing world at the moment. Some marketers are avidly against it, but you can see that Facebook is making a big push for their own companies. Experiment with both and see what works best for you. There's a significant benefit to following these aspect ratio guides. When your content is custom made for Instagram, it is viewed as more personalized content. Don't be that brand that sends out the same mass message video across all social media platforms. Brands are being discovered regularly on Instagram. 60% of its users (~600 million) use it to seek out and explore new products. If your audience is on Instagram, and your brand is embarking down the path of video marketing on there, you are making a wise choice. Develop your strategy after you’ve had a chance to take a look at all of the different targeting tools available for your posts. Experiment with varying methods of targeting and measure how your audience responds. This is how you build an engaged, loyal following. Short and sweet, short and sweet, short and sweet. Did I mention to keep it short and sweet? 60 seconds is a long time on Instagram, so if you're planning on using all of that time, it needs to be entertaining. Several brands have found that shorter videos have higher engagement with their audience. 15 seconds is the sweet spot for conveying an exciting and engaging message, but 30 seconds is still safe. Lastly, just remember why Instagram exists: to share beautiful, visual content of the world that surrounds us. Keep it simple and engaging. Your videos should be a visual storytelling experience, where your audience is able to view themselves inside your video benefiting from what you’re selling.